Basic 6: Rolls - Do You Know The Muffin Man? 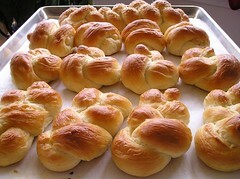 Soft bread rolls was the goal of today's class. We began by dissolving fresh yeast with water to form a yeast slurry. All of the breads I've made in the past used instant yeast or active dry yeast, so this was something new for me. Fresh yeast is faster acting than the others but much more perishable so is not usually used outside of commercial bakeries. The other ingredients were added to the slurry and then kneaded in the mixer with a dough hook. The Hobarts are certainly labour-saving and efficient and I hope to have one someday, but I missed the tactile sensations of doing it by hand. We let the dough proof, covered, for about 30 minutes. Chef had us bring our dough to the front so he could portion them evenly into 36 pieces using a dough divider. It amused me that such a large device has such a singular purpose. He then showed us how to shape different kinds of rolls. First, he made balls by working each piece with the heel of his hand against the countertop. Next, he demonstrated a 4-strand braid. I had seen this described in Peter Reinhart's book, The Bread Baker's Apprentice, but even after making one myself, I'm still fuzzy on the concept. 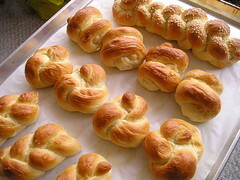 Rosettes or knotted rolls were easier, a simple knot with the other end tucked in. We also made single strand “braids” and snails, two shapes I hadn't done before. Chef also said you could make focaccia out of this dough and proceeded to make several miniature ones. I grimaced knowing that this enriched dough is completely different from the dough used to make the flat Italian bread. After an obligatory eggwash, our rolls were placed in the oven to bake. They turned out a bit tough, likely from overhandling, but not too bad. No class next week because of the Victoria Day weekend.